It seems like everyone needs an excuse to indulge. Well, you’re in luck because ’tis the season and what’s a more fun and a “healthy” way to eat a doughnut than to make it yourself? 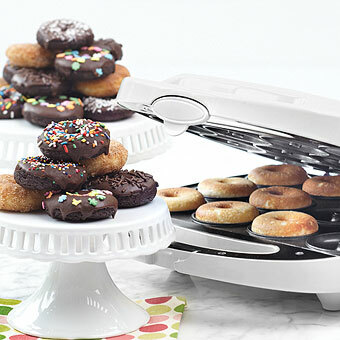 Which is why we’re loving Stonewall Kitchen’s Mini Electric Doughnut Maker. For starters, it makes minis, so you can keep your portions in check and it’s got a non-stick surface, so there’s no need for oil. Did we mention it bakes not fries these bad boys? Do you know of any recipes for this donut maker? I want to branch out from the mixes and recipe book.